(Nanowerk News) Terahertz radiation can be used for a wide variety of applications and is used today for airport security checks just as much as it is for material analysis in the lab. The wavelength of this radiation is in the millimetre range, meaning that it is significantly larger than the wavelength of visible light. It also requires specialised techniques to manipulate the beams and get them into the right shape. At TU Wien, shaping terahertz beams is now something of a resounding success: with the help of a precisely calculated plastic screen produced on the 3D printer, terahertz beams can be shaped as desired (Applied Physics Letters, "3D-printed phase waveplates for THz beam shaping"). "Normal plastic is transparent for terahertz beams, in a similar way as glass is for visible light," explains Prof. Andrei Pimenov from the Institute of Solid State Physics at TU Wien. "However, terahertz waves slow down a little when they pass through plastic. This means that the crests and troughs of the beam become a little displaced - we call that phase shifting." This phase shifting can be used to shape a beam. Exactly the same thing happens - in a much simpler form - with an optical lens made of glass: when the lens is thicker in the middle than on the edge, a light beam in the middle spends more time in the glass than another beam that simultaneously hits the edge of the lens. The light beams in the middle are therefore more phase delayed than the light beams on the edge. This is exactly what causes the shape of the beam to change; a wider beam of light can be focussed on a single point. And yet the possibilities are still far from being exhausted. "We didn't just want to map a wide beam to a point. Our goal was to be able to bring any beam into any shape," says Jan Gosporadic, a PhD student in Andrei Pimenov's team. This is achieved by inserting a precisely adapted plastic screen into the beam. The screen has a diameter of just a few centimetres, its thickness varying from 0 to 4 mm. The thickness of the screen must be adjusted step by step so that the different areas of the beam are deflected in a controlled way, resulting in the desired image at the end. A special calculation method has been developed in order to obtain the desired screen design. From this we can then produce the matching screen from an ordinary 3D printer. "The process is amazingly simple," says Andrei Pimenov. "You don't even need a 3D printer with an especially high resolution. If the precision of the structure is significantly better than the wavelength of the radiation used, then it's enough - this is no problem for terahertz radiation with a 2mm wavelength." 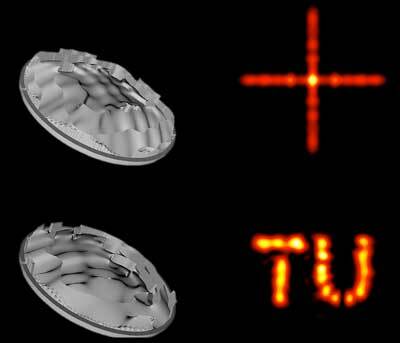 In order to highlight the possibilities offered by the technique, the team have produced different screens, including one which brings a wide beam into the shape of the TU Wien logo. "This shows that there are hardly any geometric limits to the technology," says Andrei Pimenov. "Our method is relatively easy to apply, which leads us to believe that the technology will be rapidly introduced for use in many areas and that the terahertz technology that is currently emerging will make it a bit more precise and versatile."